Austin is a city that is hard to define. This capitol city stands out with its lovable weirdness,and its artsy, laid-back vibe mixed with a good dose of Texas pride. Two days gives you a solid introduction to experience the city’s art scene, scenic outdoor spaces and rich history. Here’s what should be on your 2-day Austin itinerary. Austin is known for its hot muggy summers, and mild winters. It doesn’t rain often in Austin, but when it rains it pours. The rainiest season is in June. The best time to visit is September to May, when the average daytime temperatures hover in the 60s-80s. Despite the sticky summers, another thing to look out for is the various allergy seasons in Austin. Whatever time of the year it is, there’s bound to be a different type of pollen in the air. One of the worst periods for allergy suffers is mid-December to late-February, when the mountain cedar trees release pollen-filled clouds throughout the city. Renting a car is always a good option, since you can easily zip around the city at your own pace. Parking can be difficult, but is not impossible in most places in the city. Ride-share options like Uber and Lyft are also available, including a local company Ride Austin, which is a great alternative being a bit cheaper than its competitors, and gives you the option to round-up your fare to the nearest dollar and donate the difference. There are also pedicabs downtown, which are known for their decorative exteriors (the Game of Thrones ones is especially popular) and the cost is a tip that is usually negotiated before the ride starts. For cheap rides from the airport to various points around the city including downtown and the Southeast side, the 100-AirportFlyer is your chariot. There is also the city’s public transportation system Capitol Metro, which offers bus and light rail options. This is one of my favorite streets to walk around and soak in the funkiness that is Austin. Start at Jo’s Coffee and get in line to take a photo at their Insta-famous “I love you so much” wall. Afterward, walk a few blocks to Allen’s Boots, where you can browse the impressive collection of cowboy boots in all shapes and sizes, as well as cowboy hats, and other gear that will make you look like a local in no time. Stop in South Congress Books to browse the enviable collection of rare used books, and vintage posters. This street is known for its vintage clothing shops, but Prototype Vintage Design stands out from the rest with its well-curated collection and reasonable prices. One block over from South Congress, this street is a bit quieter than its neighbor, but doesn’t lack character. It has an abundance of street art including the Greetings From Austin postcard mural, as well as shops like Flashback, a vintage clothing store that’s hard to miss with its colorful facade and clothing decorating the front porch of the store. Embrace your creative side at Craft, a space where for $10 per hour you can craft to your heart’s content with the assortment of supplies that are provided or take one of their workshops. For a breath of fresh air right in the middle of the city, head to these scenic lakeside walking paths that provide views of the downtown skyline. I was there during late autumn, and was treated to stunning fall foliage, but I can imagine that spring blooms would be just as pretty. There are many trails to choose from, including the Ann and Roy Butler Hike-and-Bike Trail, which is over 10 miles long and makes a complete circle around the lake. If you’re in Austin during the summer, head to the lake before the heat of the day settles in and watch the sun rise as it reflects on the water. If being on the water is more your thing, you can rent canoes or kayaks to navigate the lake on. For a sight that is uniquely Austin, make sure to head to South Congress Bridge at dusk during March-November, when hundreds of Mexican free-tailed bats take flight over the lake. To get a taste of country music Texas-style, head back to South Congress Street, to this historic music venue. If you’re feeling brave get on down to the dancing floor and attempt your best two-step. This club is the best reminder that despite the prevailing hipster vibe throughout Austin, the city still has deep Texas roots. Forget your fancy evening outfits, this is the place to dress up in your best cowboy attire if you want to fit in with the crowd. There are nightly shows, check out the performance calendar here. This historical building is worth stopping by for an hour or two to take one of the informative free tours and learn about the state’s rich political past. Highlights along the tour include seeing both the House and the Senate rooms, as well as the basement. The building itself is stunning and massive, with a beautiful rotunda that sits under the main dome. The surrounding grounds are worth checking out as well, with views of downtown from the expansive lawns. Open seven days a week. Located in the backyard of an unassuming suburban home on the south side of Austin, you would never expect to find this impressive tower of junk that has been the result of the owner’s collection of over 3 decades. Wander through the tower and see all the different items up close and personal. This is Austin at its weirdest and should not be missed. Call before you go to make an appointment, since this is someone’s home. Entrance is a $5 donation. Wander around the city’s biggest university, where its undergraduate and graduate population adds up to just over 50,000 students. This public university is the flagship institution of the University of Texas system, with alumni including Neil deGrasse and Matthew McConaughey. Noteworthy stops include the Blanton Museum of Art, LBJ’s presidential library, and the UT Tower (book a self-guided tour online that includes access to the observation deck). Come back at night for a live musical performance at the legendary Cactus Cafe. Head over to this vista point right at sunset and be treated to one of the best panoramas of the city skyline, the Colorado River, and the 360 Bridge. Located in Covert Park, this spot is the highest point in the city at 775 feet. When you are up on the mountain you can really see how green Austin is with all the trees next to the river. There are some easy trails that lead you to different viewpoints, and if you go during sunset make sure to get there early since it can get crowded. If you want to go all out bring a picnic with you to enjoy as you watch the sun go down. For where to get the best breakfast tacos and BBQ, check out my Where To Eat in Austin post. 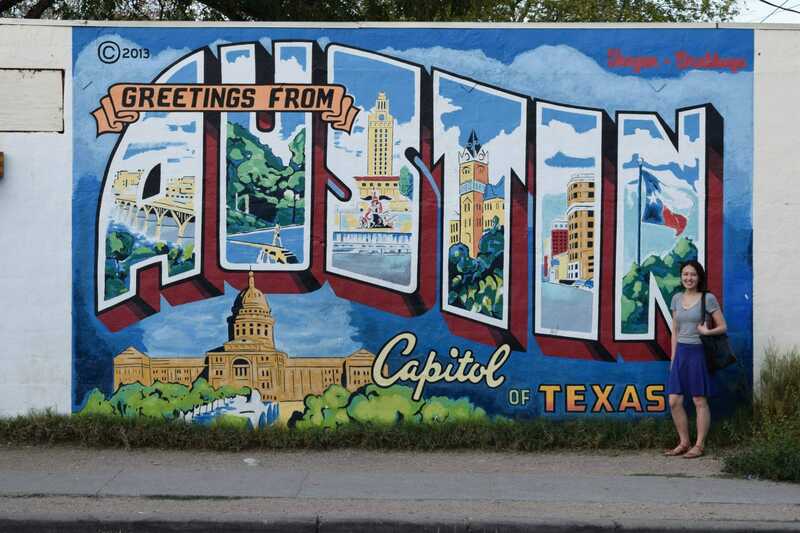 Austin can be a pricey city for lodging, especially around downtown. That being said there are some good deals if you search hard enough, as well as some options further afield in lively neighborhoods like South Congress. Located in downtown right on Lady Bird Lake, this hotel is an affordable choice compared to other hotels in the area. Highlights include stunning views of the waterfront, an outdoor pool, and easy access to nearby walking trails. A free airport shuttle is also available. A bit further from downtown, this hotel chain is ideal for those who have a rental car (there’s free parking) or don’t mind being a bit further out to save on lodging. Rooms provide a quiet and comfortable retreat from the city. A complementary breakfast is included. Dog-friendly. Located on trendy South Congress Avenue, this dog-friendly, bungalow-style hotel with lush courtyard gardens is a private oasis that makes guests feel right at home. There’s a garden bar where you can join locals and take advantage of their happy hour specials on Monday-Thursday from noon to five. This post contains affiliate links (with no extra cost to you). Thank you for supporting Small World This Is.